In December the 27th of 2005, Europa Barbarorum was released. 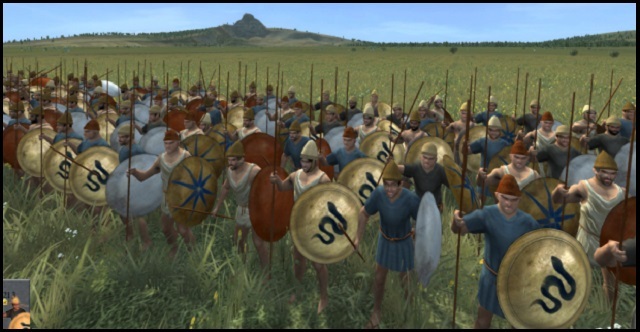 A mod that originally aimed to only add units and historically accurate stuff to barbarian factions, later grew into one of biggest and most popular mods for Rome: Total war. This one is the sequel to that mod. So, as you might've already guessed, Europa Barbarorum II is a total conversion mod for Medieval II: Total war Kingdoms expansion. It converts the game to ancient setting, with campaign starting 272 BC and ending 14 AD. However, the name is a bit misleading: this is not a barbarian-focused mods, nor a Rome-focused one, but it tries to accurately depict all factions. As a person who has never tried Europa Barbarorum RTW edition, I have to say I was very excited to test it. Will I be the ruler of the ancient world, able to build an empire that will be remembered after millenia or will I fall to ruin and will be only remembered by few lone archeological findings and written lines? Welcome to Europa Barbarorum II. Europa Barbarorum II (EBII) is set in ancient era with huge campaign map stretching from british islands to central asia, arabian peninsula and northern Africa. This is the very first good thing about EBII, the sheer size of map; it also includes Arabian peninsula, which is very often not seen entirely included. However, I noticed that there has been some amount of fantasy involved in some region borders, but I guess its ok, considering how little info we have about borders of some areas. Time passes with seasons, which means more turns and winter is only in winter, not in every 2nd turn. So far, I tried myself both the city-states of Greece (Koinion Hellenoi) and the Seleucid empire (well, more than 20 turns anyways), with both presenting their own problems. This is what I really like in EBII: it makes small and large factions in need of different things. I mean, as city-states my main problem was to build up economy and at least one stack so I could have something to use to strike if needed, while in Seleucid campaign I had armies and even a decent economy. But, as I was at war with Ptolemaios Egypt from start, and as the empire was huge (the largest one at start), I had tough time getting my armies to battle with egyptians. To make it worse at the same time I quickly hit another problem: empire wanted to collapse with many cities rebelling, which caused me to juggle armies between rebel cities and Egypt troops. I can honestly say that no other mod I have played has given me such challenging starting problems as EBII has, and this is what I like about it. However, things will calm down later in campaign, when you get your initial problems more or less solved and can think about expansion. There you have multiple tools to do that, as its the case in TW series in general: diplomacy, espionage (not exactly a tool to take over city, but it makes it lot easier) or just good old military strike. Just be warned: campaign AI in EBII is smarter than most, you may have hands full with even one opponent, so if you manage to get more than one major enemy, then it can be very challenging to keep them at bay, not to say to strike back. But let me give you an example. As Seleucid, I managed to get to war with the faction east of me, while still battling with Egypt. While thinking that it was just but a minor faction, not imagining it to be capable of striking me before I can strike them, I forget the old lesson: never underestimate your enemy. It costed me three cities in the east part in one turn. That said, campaign AI can fail drammatically as well, with managing apparently being quite bad, as I saw a lot of rebel armies on AI part. Not randomly spawned ones, but true rebelled armies that were in control of AI factions the turn before. As for the battle AI, it is satisfying. It's not the most difficult AI I ever faced (Darthmod's AI-s seemed better frankly, although I guess it's a matter of personal opinions), but anyway it can give you a challenge, so it's rarely a walk in the park. Economy too can be a challenge, especially if you are like me and don't pay much to it: you can't just set taxes at turn 1, build few buildings, make few trade agreements and then forget about it, like it happens with some other mods. I would tell you what would be required, but in my games I acted randomly to get economy side good (with some occasional cheating), so I don't know exactly what I did right, but anyway I managed to get positive balance somehow in the end. Now, concerning what I didn't like in campaign and gameplay. First, recruitment seems to be bit clumsy and slow. I mean, when you go to recruitment window in city screen, you see that you have less queue spots than in vanilla M2:TW. A bit annoying, but for a person like me, who isn't able to keep a good economy, this is already a lot, as at any rate I can rarely recruit so many at once! However, when we take into account train-immideatly slots, which can reach up to half of recruitment queue, it seems too little queue spots. Also, I kinda hate the idea of actually still having recruitment limits in place. I mean, its nice to be able to raise armies quickly in times of trouble, but for me, waiting and planning for army compositions in larger scale was part of fun. I do see idea behind it though, as inevitably you are forced to disband most armies in times of peace to collect money for further war and you need to call them up in war situation. But I still feel this makes army managing too easy and it still doesn't excuse losing few queue spots. Concerning custom and quick battles. While they are great for showcasing units made, this is actually where problem kicks in: when you press quick battle, its almost certain that you will end up with just one, two or maybe three units from the faction you are placed in charge of. The rest are from random factions and quite often exactly the same units over and over again. 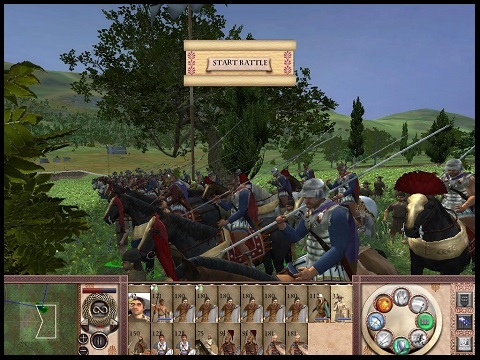 Custom battles face same problem, as while you can choose your own armies and compositions, you get selection from all 200 units from initial release, which means you have to know which troops belong to what faction. As said, that's great for checking out all troops, but bad for learning specific strengths and weaknesses of factions, which custom and quick battles should be all about. Artwork and graphics are great. Units are colorful and diverse, both in armies and in single unit with different faces, shields, armour. This is great to watch visually and is historically accurate too; as as EBII Q&A put it: "Armies in this period rarely were uniformly dressed and equipped". Campaign map, besides size, is also beautifully done in general, with the sole exception of the coasts. It has mountains, rivers, basically everything that should be there. Also menu is custom-made for the mod, which is very nice. There are also few video clips that are very rare to be seen in mods, for example the short intro clip and the one showing the faction logo when you start campaign; while, technically put, not exactly a faction intro, it still adds much to the mod. My favourite part, however, are the loading screens. They contain much info from coin pictures of rulers of some factions to equipment description of units. They are very detailed and I am bit sad that loading screens go past so quickly. How often can you say that you miss loading screens?! Unit and building descriptions in campaign map are detailed too, describing historical stuff and mentioning why they are necessary in game. 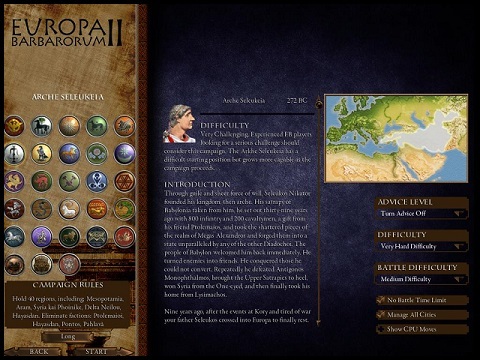 Europa Barbarorum II is an excellent mod, which biggest issues are recruitment, custom and quick battles. This mod offers a nice alternative to Rome II to those who own a computer that isn't powerful enough to run it or anyway want to try an alternative. EBII is still having some bugs and problems in general, but since this is just its first public release (along with a first patch), things are looking promising for the future. Overall, that's a 10/10 rating, a must try for any fan of the Roman age! Shame this review missed the pretty major updates we've been testing prior to the upcoming release (which started in May). The mod of now is pretty unrecognisable (mechanically, and in gameplay terms) from the 2.01 reviewed here. And now EBII has had it's next major release, so another review is due.